Active filters are power electronic devices connected in parallel with the load to be compensated. The device can be thought of as a controlled current source, which provides any kind of current waveform in real time. When connected in parallel with the nonlinear load, its harmonic currents are compensated and the network is loaded with fundamental current only. The control system monitors the relevant parameters of the network and is capable of detecting and instantaneously reacting to any disturbance in the load current. Our AHF series is an advanced modular Active Harmonic Filter (AHF) system. The AHF system is constructed of one or several filter modules with system controller. 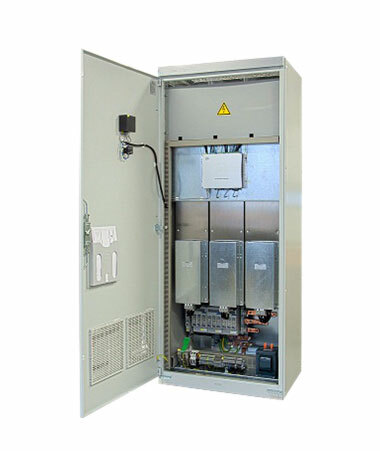 Filter modules and controller, both are embedded in our standard cabinets. CT terminations are fixed in a standard cabinet, and the AHF capacity can be configured accordingly to user requirement. The filter capacity can be easily expanded at the user’s site by adding extra filter modules as per site requirement. Higher operating temperature up to 50 Deg. C.